To know George Burns is to love George Burns. The cigar, the glasses, the wit and the kind Grandfather-like image he projected in his later years all found a way into our hearts. Many of us grew up with George as another member of the family. Relive those memories at the German American Heritage Center on March, 23rd at 7 Pm! 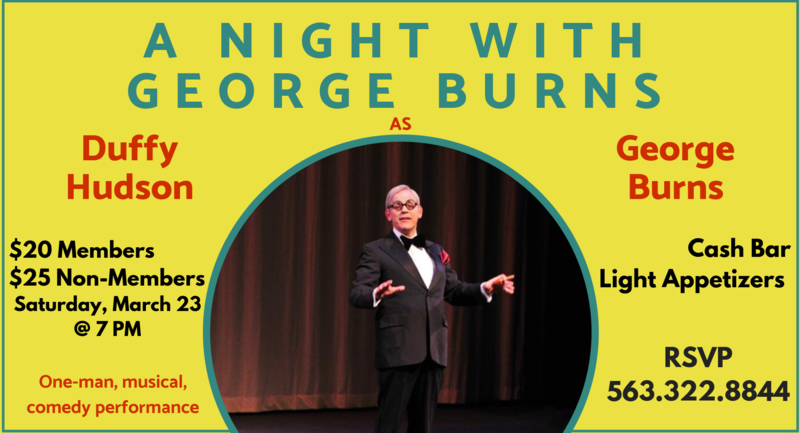 Duffy Hudson, award-winning master impersonator with acts you may remember including Houdini, Dr. Seuss, and Einstein, will reprise his role as George Burns reliving his life, performances, and the personality you all remember! Pre-registration is required and tickets will be $20 for members and $25 for non-members. Light appetizers will be provided as well as a cash bar.